Recently I was asked to create desserts for the Causes for Kids fundraiser. This is a great cause that is committed to working to protect childred by preventing child abuse. I felt the theme of the desserts needed to be fun and child-like, but with an upscale twist. Boozy Pudding Shots, Chocolate Kahlua Brownies with Whiskey Soaked Cherries and Red Velvet Cake Balls all worked perfect for whimsical childhood treats. But I couldn't shake the idea of the most classic dessert of them all- the rice krispy treat. 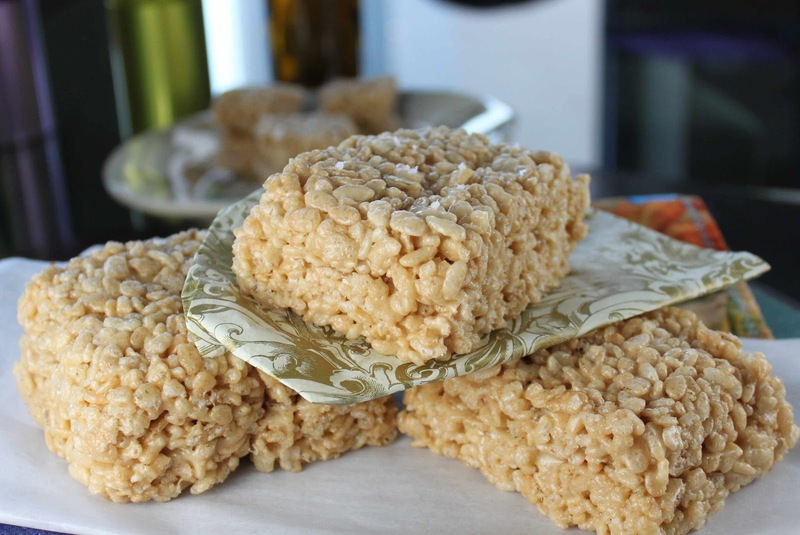 We've all seen rice krispy treats with other flavors of cereal in them, we made thousands of them at the restaurant. But something more 'refined' was needed for the guests attending this soiree. Using a caramel marshmallow base was pure genius (yup, patting myself on the back for this one) - the treats stayed soft for a week! Adding the smoked salt really put it over the top. It's almost like a salted caramel with crunch, but really more like a caramel-y rice krispy. There is no reason why all of us are not involved in or giving to a charity, so do your part. It will make you feel good. There is also no reason to wait for a fancy party to make these ooey gooey Fat and Happy treats. They will also make you feel good, trust me! Fat and Happy Food Blog Tips and Techniques: Purchase smoked salt at a local spice store or make your own by smoking it on the grill or soaking it in liquid smoke. Search the net for exact specifications if you decide to make your own. Melt the butter in a large pan over medium heat. Whisk in the brown sugar, don't worry if it doesn't doesn't all come together at this point but do be careful not to burn it. Continue to whisk while the sugar melts. Then whisk in the cream, this should all come together at this point. Simmer for about 2 minutes to make sure the sugar is well dissolved. Add in the marshmallow, turn the heat to low and stir until they are melted and the mixture has come together. Quickly add in the rice krispies and stir to combine. Pour into a greased pan and quickly smooth the top. Sprinkle on the smoked salt immediately. Allow the treats to cool slightly before cutting them or just dig in with a spoon while they are still hot.